The freestyle and the breaststroke are two of the four strokes used by competitive swimmers in the individual medley race. The others are the backstroke and the butterfly. The number of calories you burn swimming depends on your weight and effort, but on the average swimming the breaststroke burns the same amount of calories as swimming the freestyle vigorously and more calories than swimming the freestyle with a moderate effort, according to Wisconsin Department of Health and Family Services' study of 175 exercises. Burning 3,500 calories is the same as burning 1 lb. Different people burn different amounts of calories doing the same exercise. Heavier people burn more calories than lighter people. That’s why women, who have about half the muscle mass percentage of men, have more trouble losing weight. The most crucial criteria, though, is effort. Your heart rate measures effort. It must be about 50 percent of its maximum, which is 220 heartbeats per minute minus age, to improve your fitness. When your heart rate increases, you need more oxygen. You burn more calories when you burn more oxygen. The freestyle is also known as the crawl. It’s the fastest stroke and the one that is used most often. 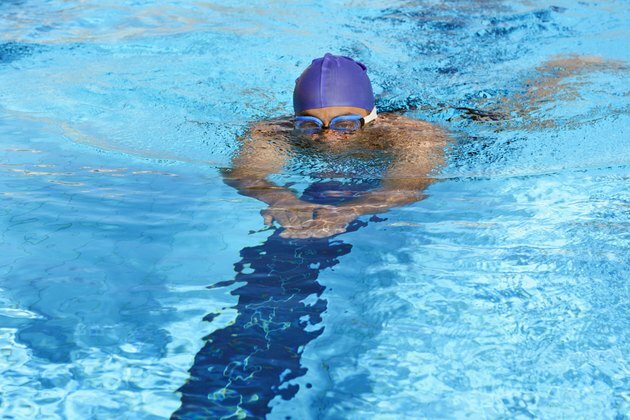 Swimming the freestyle with a vigorous effort burns on the average 863 calories per hour if you weigh 190 lbs., 704 calories per hour if you weigh 155 lbs. and 590 calories per hour if you weigh 130 lbs., according to the Wisconsin study. You’re exercising vigorously if your exercise heart rate is 70 to 90 percent of its maximum, according to the American College of Sports Medicine. Swimming the freestyle with a moderate effort burns on the average 690 calories per hour if you weigh 190 lbs., 563 calories per hour if you weigh 155 lbs. and 472 calories per hour if you weigh 130 lbs. You’re exercising moderately if your exercise heart rate is 55 to 69 percent of its maximum. The breaststroke is used far less often than the freestyle. Breaststrokers move their arms from in front of their heads sideways to their shoulders while they’re in a froglike position. Swimming the breaststroke on the average burns 863, 704 and 590 calories per hour in 190-, 155- and 130-lb. people, respectively. The Wisconsin study differentiates between vigorous and moderate freestyle swimming, but only reported one “general” figure for the breaststroke, backstroke and butterfly. More difficult strokes burn more calories because they require more effort. The butterfly stroke is the most difficult and the backstroke is the easiest, according to the college textbook “An Invitation to Health.” Consequently, swimming the butterfly burns 774 calories per hour on the average in 155-lb. people while swimming the freestyle and the breaststroke burn an average of 704 calories per hour and swimming the backstroke burns an average of 563 calories per hour in 155-lb. people.